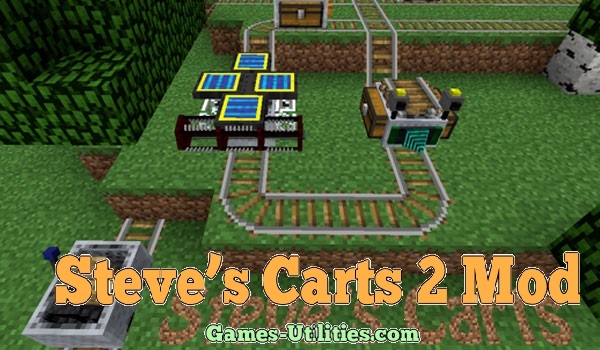 Steve’s Carts 2 Mod for Minecraft is a modular system in which you will lets you to build hundreds of carts and by combining the parts. It recreates the original Minecraft system and removes it limitations. You can create infinite number of carts using it. But, first you have to build cart assembler through it’s recipe then proceed with the cart system. It is a fun-to-play with mod and it supports multiplayer. The current Steve’s carts version is alpha 109 which works on Minecraft. Description: A custom mod for Minecraft to create transport (carts). Fixed a bug where the Hydrator still thought it was occupying the sides of the cart. Renamed Cargo Manager to External Manager, it now handles liquids as well. The Hydrator lost its liquid storage, it now requires a tank module to work. Fixed a missing texture bug in the Detector Manager. To get started building carts you should build a cart assembler. Then you’ll need a hull of your choice as well as all the modules you wanna add. Then you can just do so in the assembler. You also need coal in the left hand slot of the two slots on the right. The cart will be placed in the right hand one when it’s done. Download and install Minecraft Forge API and launch Minecraft once to complete installation. Find Minecraft installation folder. Go to Start Menu > Type %appdata%/.minecraft/ and press Enter. Then Go to Mods folder. It is created automatically after Forge installation. Make a back-up of your current Minecraft directory. You can read cart recipes, upgrades here.